The Tipping Point. Malcolm Gladwell has published a book on it and every entrepreneur wants to reach it. It is that point in which you have broken through to reaching a mass audience. Some people have reached the tipping point but they don’t even realize it. In terms of Internet Marketing it can be getting to the front page of Reddit, being shared on The Drudge Report or showing up on the front page of Google for a viral search phrase. Luckily, I reached the tipping point this past weekend and my business website will never be the same. Here is what happened. On Wednesday, October 22nd, 2014 I received three emails from business partners asking for an invite to Inbox. These are individuals that are not tech savvy, they do not use Google+ or sit on Twitter. In fact, I would consider them much more business focused than tech focused. If they were seeking out an invite for a Google product it must be worth their time. We aren’t talking Wave or Google+ here. We are talking a service they will immediately start using to make more money and ultimately, make their lives easier. After doing a little bit of research I quickly realized why they wanted an invite to Inbox. If you are still looking for an invite check out this link: Where Can I Get an Inbox Invite? Google Inbox is Gmail on steroids. It basically makes Gmail a more powerful tool. The most attractive thing about Inbox is it was built for a mobile experience. This is the first true Gmail product that was built for mobile. In fact, it may be the first established Google product that was being enhanced for Android and iPhone. When I saw screenshots and heard the chatter online I knew this was something I had to try out. Rather than going on Google+ threads or begging people on Twitter for an invitation to Inbox I decided to write a blog post for my Wojdylo Social Media website. I was completely aware of the fact that almost every user of Gmail wanted an invite so I made the post about them rather than about me. I explained what the new Inbox was capable of doing. I had seen screenshots and videos and I made a few bold predictions. At the very end of the article I asked if anyone had an extra invite they could send me. My intention of the article was not to get an invite for myself. I wanted others to get invites through the resource. I wanted to create a small Google Inbox community on my website. I know how valuable getting answers can be. Most Gmail users wanted to know who they could talk to to get an invite. I was going to provide a forum of Google users to discuss how they could get an invite. Fortunately, one of my good friends, Jesse Hollington, read the article and sent me an invite. The rest is history. Shortly after publishing my Google Inbox article on Friday (around 5:00 pm est) I shared it on Google+. I knew I had a following of users that would enjoy the opportunity to try out Google Inbox during the invitation only stage. I received about 30 comments in the first hour. I was shocked at the immediate response. I was verifying the comments as quickly as I could. By the end of Friday night I had about 50 comments from individuals looking for invites to Inbox. I noticed that my article had been crawled by Google but it definitely was not ranking on the front page for the keyword phrases that were going to bring large amounts of traffic. If I could get to the front page for “get inbox invite” I knew I would get swarmed with traffic and comments. Over the course of the entire day on Saturday I shared the article on Google+ three times. Each time, I saw a jump in comments; approximately 25 comments each time I shared. By Saturday night I noticed I was getting a little bit of Google search traffic. I had received about 50 search visitors for very long tail keywords. It was exciting to see my search traffic increase. I went to bed Saturday night not knowing what Sunday would bring. For those that may not know, Sunday morning is the slowest time in terms of Internet traffic; especially search. When I woke up I had received over 100 new comments with over 350 search visitors. This was all before noon eastern! This was the tipping point. Throughout the entire day Sunday I was receiving between 25 and 40 comments per hour and it was all from Google search. Sometime early Sunday morning I hit the front page of Google for “get inbox invite”. I am certain there were a myriad of other keywords I ranked for as well. By the end of the day on Sunday I had received over 900 search visitors to my Inbox invitation article. Note that these were search visitors and not visitors from social media, news outlets or other articles. 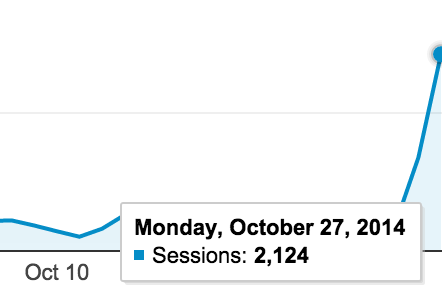 Receiving this many search visitors on a Sunday meant that I was set up to get crushed on Monday morning. On Monday morning, around 9:30 am est I checked my Analytics. I had already received over 1500 search visitors to the article; by 9:30 am! As of 1:30 pm est I had received over 2000 search visitors and the number of real time active users on my site bounces from 30 to 50 depending on the moment. I have over 600 comments on the resource and that number grows each hour. My goal was to help users find invites to Google Inbox. In the last four hours multiple users have left comments saying they have invites to offer those on my website. This puts a smile on my face. As soon as I get more invites I am going to share them with those that have been conversing in the comments of my Inbox invitation resource. When all is said and done I would love to know that Jesse Wojdylo helped thousands of people get their invitation to Inbox. I can clearly remember Kevin Riley giving my invitation to Gmail back in 2005. Paying it forward seems to always work out in terms of Internet Marketing and life in general. I will continue to update this post with my traffic numbers. If you are interested in better marketing your business or product, please feel free to reach out to me at jwojdylo@gmail.com. Cool stuff, glad it worked! Yes, I’m looking for an invite too! Thanks for the article. I very much intend to pay it forward if I get my hands on an invite. an invite, if possible, appreciate very much. I’m also waiting for past 1 week. But there is no response from Google. But they send a conformation mail , “Thanks for requesting an invite. We’ll send you one as soon as possible.” this was the mail i got. Hi and please! It has been two weeks waiting for an invite here…. I’d love an invite if you have any spare. thanks!